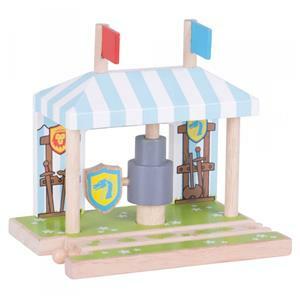 Prepare for battle and to fight off the bad guys by training up your knights with the Bigjigs Rail wooden Training Ground. Set comes complete with moveable red and blue flags and knights shields, choose your side - can also be used to stop trains. A great addition to any wooden train set. Encourages creative and imaginative role play. Helps to develop dexterity and co-ordination. Most other major wooden railway brands are compatible with Bigjigs Rail.